There's a frustrating traveller's paradox, where seeking authentic experiences in a foreign country results in those experiences becoming inauthentic. 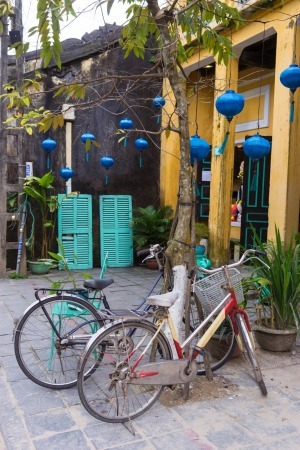 Hoi An in Vietnam is no exception. 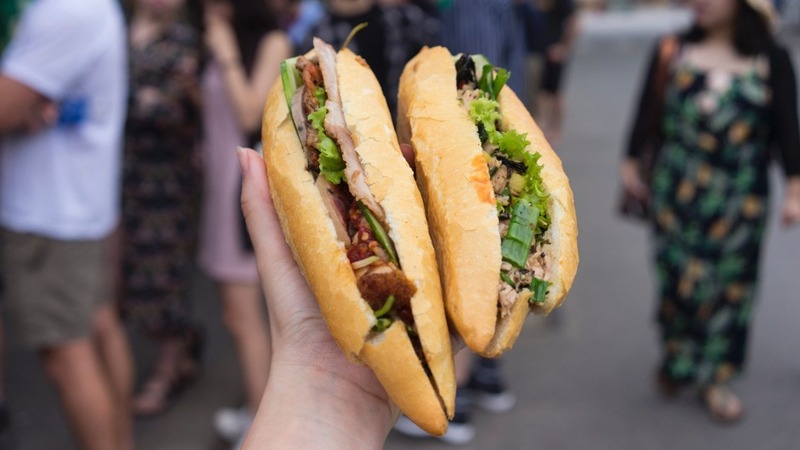 Stroll along the Thu Bon River, past French colonial buildings and decorative Chinese shophouses, and you'll find culinary tourists queuing outside Banh Mi Phuong, which shot to fame thanks to the late Anthony Bourdain. Around every corner of the UNESCO heritage-listed Old Town is someone wedged in an atmospheric nook wielding a selfie-stick. So it surprises me when my respite from the throng comes in the form of a food tour. Recommended by Grantourismo, a duo of journalists with incredible knowledge of south-east Asia who offer customised itineraries, the Original Taste of Hoi An is the most informative, engaging excursion I've been on in all my travels. Australian "retiree" Neville Dean, 70 (or "60-and-10-year old", as he prefers to say), has been running the Original Taste of Hoi An with his wife Colleen for eight years. His first taste of the country was in 2005, when global youth leadership group AIESEC invited the former marketing and business consultant to Ho Chi Minh to deliver a keynote address on right-brain (creative) thinking. Back in Tasmania, he told Colleen he'd found his "spiritual home". Neville later returned to Hoi An, where he spent a few months working remotely. It was here he overheard two Americans asking for hamburgers at a local restaurant. Despite having written The Theatre of Business, a book about finding life's purpose, it wasn't until that moment that Neville realised his own – "discovering and sharing the food of Hoi An". Back in Australia once again, he and Colleen reassessed, sold their waterfront property and moved to Hoi An. Neville picks us up in a 4WD from our hotel at 7.10am sharp. He's extremely tall, and dressed in a green button-up shirt and white shorts, with an army-green cap covering his white hair. He looks more like a tourist than most tourists. We're dropped on the doorstep of a sinh to trai cay (fruit shake) stand to meet our on-the-ground walking tour guide, Sen.
Neville teases Sen as he introduces her, explaining that they met at a restaurant on nearby An Bang Beach. "The menu was written in Vietnamese but it could have been Swahili, and this woman comes up to me selling pearls – you know, 'she sells sea shells by the sea shore'," he says. Sen helped him decipher the menu, but won him over with her sass. Their spirited repartee is a highlight, but Sen's cheekiness continues throughout the tour (she's quick to point out the difference between "morning glory" in Vietnam and Australia). Crossing the road to Tan An Market, we stop outside a noodle stall. Later I learn that more than 40 vendors benefit financially from the tour, with Neville paying the noodle maker for the privilege of standing in front of and photographing her shop. Sen feeds us like it's going out of fashion, piling plastic bags and polystyrene containers with long, latticed cha gio spring rolls and tofu, sprouts and fungus. We stop for kem ong, long ice-creams on skewers pulled from stainless steel tubes like Indian kulfi, and fail to pick the mystery flavour (Red Bull). There are dishes I've never heard of (xi ma, a warm sesame dessert) and comforting noodle soups for days. Dishes come thick and fast from roving vendors, hole-in-the-wall cafes and restaurants. I'm midway through eating mi ga (chicken noodle soup) when Sen thrusts the best banh mi Bourdain never managed to find into my free hand, hot from a street vendor called Banh Mi Tam Hoa. I hope her mantra, "You eat more in Vietnam, you lose weight", is true. We walk through quiet backstreets to the Original Taste of Hoi An's headquarters, where Neville rejoins us at the tasting table. Full to bursting, we're treated to stories that intertwine history, culture and cuisine. A platter of faux meat arrives as we're touring on a vegetarian day in the lunar calendar, along with meatloaf wrapped in banana leaf, a five-generation chilli sauce, gelatinous sweets and so much more. Neville shakes with enthusiasm sharing food stories he's told hundreds of times. He speaks of kheo tay, a Vietnamese expression that translates to "dexterity" but means something closer to "loving care". 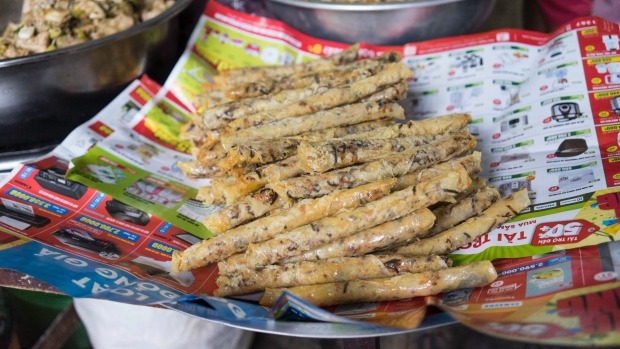 You can taste it in the famed cao lau rice noodles, he explains, tinged yellow and chewy from thousand-year-old well water and ash from a particular tree, and also in delicate white rose dumplings made by a single family that supplies all the restaurants in Hoi An. "There are more than 800 restaurants on TripAdvisor in Hoi An and at least another 800 hole-in-the-wall ones that would never make it onto TripAdvisor," says Neville, who discovers a new dish every week. His company is 51 per cent Vietnamese-owned, with staff paid pro-rata and vendors often compensated twice what a dish costs locals. 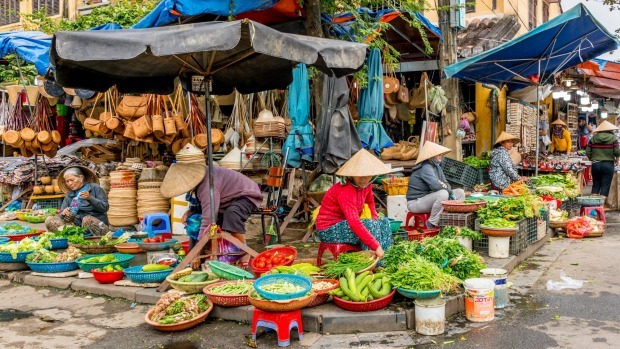 Aged 60+10, Neville is planning to hand the business over to the Vietnamese staff, including Phuong, who runs the tastings and often brings people to tears sharing her experience as a victim of Agent Orange alongside her cultural knowledge. "It would be downright arrogant of me to say I know everything about Vietnamese culture. They talk from the heart, I'm just an appreciator," says Neville. It's only when I open my inbox to thank him for our four-hour, 45-dish education that I notice his email address for the first time: theteacher@tasteofhoian.com. Of course. An Bang Beach: Ride a bike or taxi to this small beach, then walk left, away from the tourist-trap restaurants until you reach Hana Quiet Beach Restaurant. Sun beds are free if you order lunch, delivered fresh from Hana's kitchen. Night Market nibbles: Browse the stalls at the night market on An Hoi Islet, where you can buy silk lanterns and souvenirs (remember to haggle) and snack on street food. Touristy, but worth it. Sofia Levin was a guest of Anantara and the Original Taste of Hoi An.